Two weeks, 30 meals*, and nearly 1,000 photos later, we've returned from Southeast Asia. It's nice to be back in our own home, in our fair city (which compared to the Maryland suburbs has too much pollution but compared to Vietnam smells like I imagine Little House on the Prairie did). But still: even with all of our creature comforts, I find myself really missing Thailand in particular. Both Chiang Mai and Bangkok had so much to offer in terms of food, culture, and cheap massages. I wish we'd had more time. I'm currently going through all of my photos from the trip, and over the next couple weeks, I'll post some of my favorite images and tell you a few good stories (let's face it - they're mostly about amazing meals). For now, I'm gradually relearning my way around a kitchen, reminding myself that oh, I really do love to cook. The muscles are soft from lack of use; it'll be a while before that kitchen feels like home again. Also, it is cold here. I left DC when it was maybe 60 degrees, and went to two countries where seasonal attire in December is shorts and a t-shirt, with a jacket for nighttime if you're lucky. I return to freezing temperatures and wind? Dislike. As if on cue, our HVAC sputtered yesterday. Around here, we're getting professional at wrapping the blankets around our bodies just so. Fortunately, we've got hot chocolate. Before I left, I was getting really into an only-slightly-indulgent routine of having hot chocolate in the evenings. I'd been riffing on my usual recipe, adding mexican cinnamon and smoked chile, or a dollop of salted caramel. When you're starting with good hot chocolate, It's hard to go wrong. We returned to an empty fridge, though -- and in the shonde of all shondes, we also were out of chocolate. Unfazed, I started poking around online looking for non-chocolate milk-based drinks. Pretty quickly, I landed on a page from Saveur that promised thick, spiced white hot chocolate. I can already hear the rumblings from the "white chocolate isn't chocolate" camp. Alright! No fights there: I cede your point. But white chocolate is good in its own right. (It's especially good if you coax it to look more and more like its distant relative.) 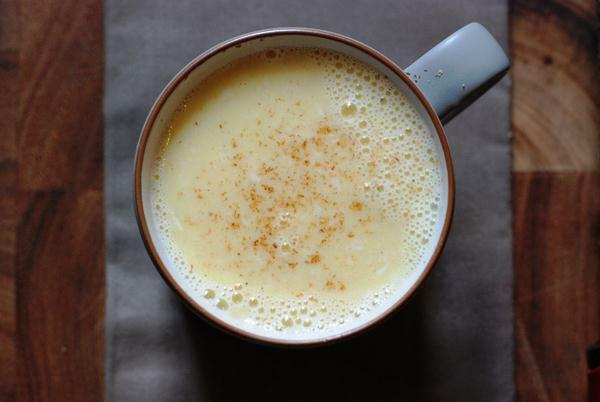 And when stirred into hot milk spiced with fresh cardamom, it makes a superb drink. It's creamy, even without whipped cream, and it's rich but not overly so. 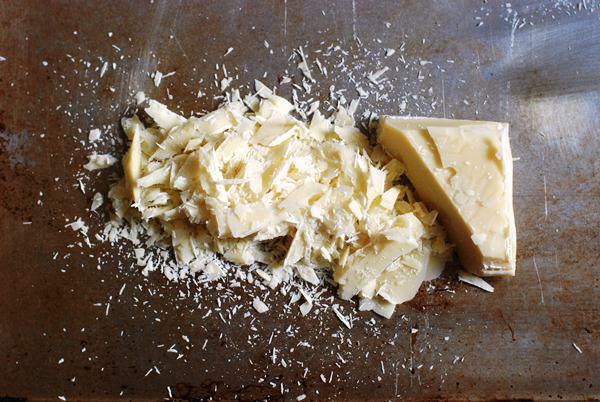 The dusting of grated nutmeg, I think, is what takes it from sweet tasty drink to something special. This is supposed to be a pretty cold weekend - I'll be sipping on one of these. Okay, probably more than one. *I'm only slightly embarrassed to admit that I ate several second breakfasts and a few second lunches. You only live once! As I was writing this, I remembered these caramelized white chocolate rhubarb bars from earlier this year. They were damn good. I had a bit of extra white chocolate left over after testing this recipe, so I caramelized it - and then turned it into this hot chocolate. To get the obvious out of the way, it was delicious. But the cardamom came through less, and the drink needed a more generous dusting of nutmeg. If you're in the mood to caramelize, don't let me stop you - but this drink is best with pure, white chocolate. Go forth. Heat milk, cream, and cardamom over medium heat until bubbles start to form on the surface, about 3 minutes. Turn off heat, cover pot, and let milk steep for about 15 minutes. Remove cardamom seeds, and reheat milk until bubbles again form around the edges. Stir in chocolate, and let sit for 1 minute. Stir in vanilla, pour into mugs, dust nutmeg overtop, and serve immediately.